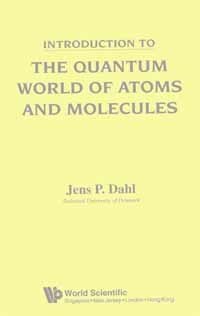 J.P. Dahl's Book : "Introduction to the Quantum World of Atoms and Molecules." Component of : Early Ideas in the History of Quantum Chemistry. J.P. Dahl : Introduction to the Quantum World of Atoms and Molecules. World Scientific Publishing, Singapore, 2001. The present book is based on lectures given for the past several years at the Technical University of Denmark. The lectures have primarily been attended by students wanting to specialize in advanced fundamental chemistry (including quantum chemistry) or solid-state physics. They have also been attended by Ph.D. students. Quantum mechanics is one of the greatest intellectual achievements of the twentieth century. It constitutes the firm foundation of modern physics and chemistry, and has to a large extent led to a synthesis of these sciences. Accordingly, every modern physicist and chemist must familiarize him/herself with the laws of quantum mechanics, in order to understand the basis of the enormous scientific and technological progress that the application of these laws has brought about. The present treatise is an introduction to the quantum-mechanical laws with a molecular angle of approach. It should, however, be useful for most students of ordinary matter. I have chosen to make the presentation exact, but at the same time pedagogically obliging. I value the historic tradition. I have, therefore, in the first two chapters tried to draw a picture of the way quantum mechanics emerged at the beginning of the twentieth century, in reply to efforts spent by chemists and physicists throughout the nineteenth century to make atoms real. It took a quarter of a century to develop the proper basis of quantum mechanics. The highlights of the process are included in the second chapter. The Schrödinger equation is presented in Chapter 3. It is this equation that governs the behavior of electrons and atomic nuclei and thus supplies the basis for our understanding of atomic and molecular structure and molecular processes. The Schrödinger equation is solved for some simple, yet illustrative examples in Chapter 4. On this background the quantum-mechanical formalism is cultivated in Chapter 5. Emphasis is put on the properties of operators, quantum theory and measurements, and matrix algebra. In Chapters 6—9 we discuss some exactly solvable systems in detail, namely, the free particle, the harmonic oscillator, and the hydrogen atom. In addition to solving these problems analytically, we also become familiar with wave packets, ladder operators, angular-momentum theory, and the general central-field problem. A very fundamental concept in the theory of atoms and molecules is the electron spin. The magnetic moment that accompanies the Spin gives rise to important effects. But the conceptual importance of spin is greatest in the interplay between spin and the antisymmetry requirement that is laid on many- electron wavefunctions. It is, for instance, in this interplay that one finds the origin of the periodic table and directed valence. Chapter 10 is devoted to a detailed description of the electron Spin and its interaction with external fields. The interplay with the antisymmetry requirement is discussed in Chapter 11, which also gives a description of the many-electron atom on the basis of electron configurations and introduces determinantal wavefunctions. The Schrödinger equation is exactly solvable only for the simplest systems, but very effective methods have been developed by means of which good ap- proximate solutions may be determined even tor quite complicated systems. The most frequently applied method is the variational method. Chapter 12 gives an introduction to this method. In Chapters 13 and 14 we give the general principles for the quantum- mechanical description of molecules in terms of molecular electronic structure, molecular vibrations, and rotation. The discussion is concretized for diatomic molecules. The description of the electronic structure is based on exact wave- functions tor the single-electron molecule, and on electron configurations for many-electron molecules. The remaining five chapters of the book are devoted to a deeper study of many-electron atoms and molecules. The concepts of terms and multiplets are discussed in Chapter 15, after a thorough discussion of the theory of angular-momentum coupling. In Chapters 16 and 17, we construct proper many-electron wavefunctions tor selected atoms and molecules. We also derive expressions tor the term energies of these systems by exploiting expressions for matrix elements between determinantal wavefunctions. In Chapters 18 and 19, we discuss the determination of atomic and molecular orbitals by self-consistent field methods. The Hartree-Fock method is discussed in Chapter 18, by the author's own pedagogical approach, in which die so-called Lagrangian multipliers play a less dominant role than in most standard presentations. The multipliers are usually introduced in a fairly mechanical way that causes difficulties for many students. The alternative self-consistent field method, the Kohn-Sham method, is discussed in Chapter 19. The method is based on the premises of density- functional theory, according to which all ground-state properties of an atom or a molecule are functionals of the electron density. We discuss density functional theory by imbedding it in the theory of reduced density matrices. This makes the energy expressions more transparent, and also demonstrates that the gap between Hartree-Fock theory and density-functional theory is smaller than one might otherwise suspect. I believe that the present book gives the student a good understanding of the basic structures and the basic concepts of atomic and molecular quantum mechanics, although the coverage is far from complete. As to applications of atomic and molecular quantum mechanics, they are extensive and very suc- cessful. Some applications are included in the text and in the end-of-chapter problems, but the number is naturally quite limited. Fortunately, more and more textbooks now appear that do in fact focus on the various applications of atomic and molecular quantum mechanics. Those books are the ones that should be consulted for detailed information about each application. During the preparation of the lecture notes behind this book, I have received many valuable comments from both students and colleagues, for which I am very grateful. My particular thanks are due to Dr. Helge Johansen for many years' fruitful collaboration in teaching quantum chemistry, and to Dr. Bjarne Amstrup for his enthusiasm and his expert assistance with the initial typesetting of the emanuscript with LATEX. Finally, and most importantly, I am grateful to my wife Asta for her patience and constant encouragement. 11 The Periodic Table by Electron Counting .....................................  24. 13.2 One-Electron Diatomic Molecules .......................................  3.. Copyright © Sept. 25, 2002 by U. Anders, Ph.D.